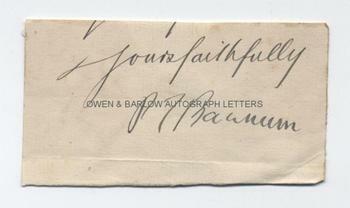 P T BARNUM Autograph Signature. Phineas Taylor Barnum, American showman, scam-artist and hoaxer. Proprietor of Ringling Bros and Barnum & Bailey's Circus. Autograph signature and subscription "yours faithfully" cut from the foot of a letter. On paper piece measuring approx 4 x 2 inches. Mounting remnants on verso. Very good. P T Barnum can lay some claim to be the greatest showman of all time. His circus was the original "greatest show on Earth" and "three ring circus" and he was the man who gave us Jumbo the Elephant, the midget Tom Thumb, the original Siamese twins Chang and Eng, and the Feejee Mermaid woman. He also promoted various other events and was much involved in promoting the meteoric career of the Swedish singing sensation, Jenny Lind. P T Barnum is known as much for his outrageous sales gimmicks and hoaxes, which are the stuff of showbiz legend.